It’s monsoon. Expect rain. Sometimes it pours! So rain cover for you and your equipment is highly recommended as part of your bag & baggage. Any personal medicines. Sirsi is a moderately big town with good medical facilities, but we insist you not to take any chances and it is always better to carry your personal medicines. We lay a lot of emphasis on individual attention and individual breathing space. On this particular tour we do not intend to encourage more than 4 members. Arrive at Sirsi in the morning and transfer to Hotel. Freshen up and have breakfast. We will be starting the trip by proceeding to Benneholey Falls. The road to Benneholey itself is a pleasure with plenty of opportunities for various genres of Nature Photography. 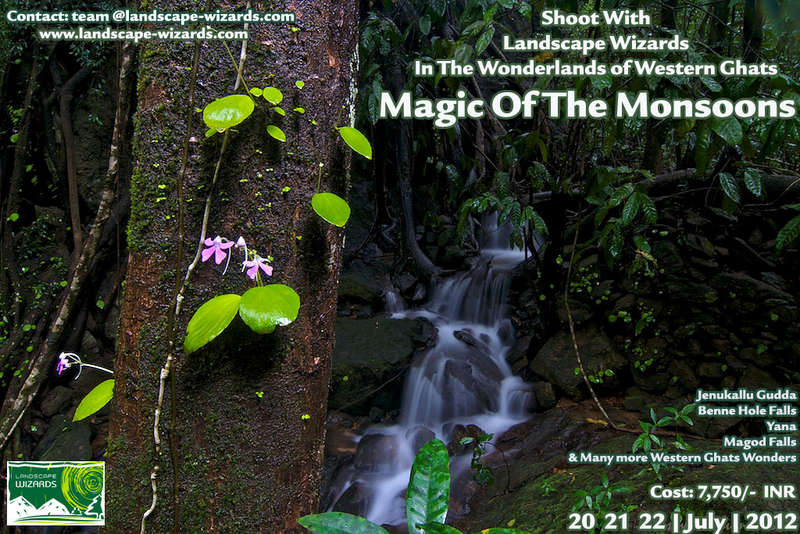 We will be spending much of our time enroute as well to enjoy the beautiful streams which form only during the monsoon and which are a treasure for Landscape Photographers. After spending some amazing moments amidst Nature and feeling what monsoon inside the a wet rain forest feels like, we will head back to Sirsi to have some good rest in the evening. Morning – We will checkout of Sirsi early in the morning and head towards Yana. The route to Yana has some pristine forests which are full of small streams and forest fauna. We will be shooting all along the route since there are some excellent places before we actually reach Yana. Yana is a photographer’s dream. The natural rock formations will make everyone who visit the place awestruck. We will spend good amount of time exploring various photography opportunities at this place before we leave for lunch. Post Lunch – we will be moving towards Vibhooti Falls which is close to Yana. The marvelous beauty of this falls is such will make everyone so refreshing that people seldom want to come back from the place! Loads of photography opportunities en-route to this falls and at the place also. After we quench our thirst to shoot we head towards Yellapura where we will be staying overnight. Morning – Today we head to one of the most beautiful and scenic place of the region – Jenukal Gudda. Teeming with shooting opportunities this place is a wonderland for Nature Photographers. We will spend our entire morning at the place shooting amidst the melodious songs of Malabar Whistling Thrushes, which are active in the valley during early mornings. The clouds passing by will bear witness for our excellent photo shoot this morning. We will head back to Yellapur for the lunch. Post Lunch: We will be checking out from our Hotel in Yellapura and head towards Magod Falls. Enjoy the beauty of the falls with some pristine view of the valley beneath before we start towards Sirsi,where we formally end our trip on a happy note. Travelling expenses from Sirsi to all the places mentioned in the itinerary. Accommodation for 2 nights on twin sharing basis. Vegetarian breakfast, lunch & dinner for all the three days including coffee/tea. Accessories needed for the trip, like leech socks and rain covers for the camera etc.